I'm in the process of adding my past font work onto this new store as well as some new stuff. I'm starting a Names Database here, hoping to eventually cover all names alphabetically (though perhaps not in order!) so if any of you want a name done up or that of a friend, just let me know and I'll add it on! And that, folks, is all for now. Phew. Life is also very insistent when it needs attending to and easily distracts one from creative pursuits no matter how much one procrastinates ... :) I've had so much to attend to lately that I find myself slightly (or hugely depending on how I want to view it) blocked where art is concerned at the moment. So I've been fiddling around more with typography lately and this is one of the results. I hand-draw into my sketchbook first now, as my tablet PC seems to have given up on me, and then scan the drawing in and polish it up in photoshop. After which I transfer it into Illustrator to fine tune the lines as it's the smoothest way of changing the colours on the letters if I wish to do so. I'm considering opening up a new store on zazzle devoted entirely to my play with fonts and type design, as they seem to be getting increasingly popular. It's also fun and almost as therapeutic as drawing, so I won't be giving up on it anytime soon. Cheers! Drawing in coloured pencil. The green background was digitally added after I'd scanned the drawing in. 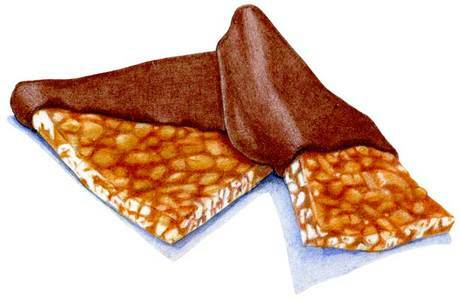 I've become horribly addicted to these chocolate dipped peanut brittle snacks. Delicious. Had to give the last lot of them away to a friend before I turned into one!